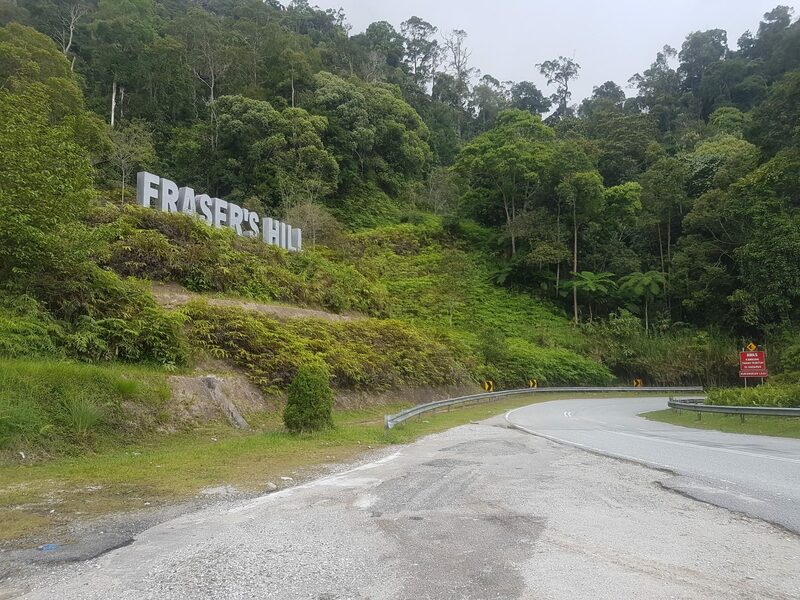 This ride takes you on a 220 km loop from Kuala Lumpur to Fraser’s Hill; a small colonial style hamlet in the Pahang Rainforest famous for being a naturalists’ paradise. Rolling out of town should be done with caution as the road surface from the inner city to the city limits is variable. Over the last few years the city has been resurfacing the arterial roads in Kuala Lumpur and as a result most of the roads are good quality. However there is still the odd road with weather damage and potholes. Once you reach Jalan Sungai Tua you are at the city limits. Taking a right turn at the mosque the first climb of the day presents, commonly referred to as “The Wall” for its appearance. The climb is a 1.1 km, Category 4 affair, averaging 8% and gaining 94 vertical metres. As you crest the wall the road levels before you descend a nice winding road. The corners are open enough you need not break too hard and the surface is kind for a fast descent. Shortly following ‘The Wall’ is another climb on Jalan Sungai Tua, commonly referred to as ‘Evian’. ‘Evian’ is a Category 3 climb at 6.6 km in length and averaging 4%. The climb is named after the waterfall which presents around three quarters through the climb. ‘Evian’ comes at kilometre 22 in the ride and starts by gently raising in gradient between 1% to 3%, before starting to bite after the 3 km mark. From here it’s a 4% average gaining another 169 vertical metres in 3.76 km. The final 2 km to the signpost averages over 5% so don’t go too hard in the beginning because you’ll need your legs at the end. Once you pass the sign you can enjoy another open descent which, again, can be taken without the use of breaks. The surface is good along the descent; however stay alert, there is usually some form of traffic. You are now 40 km into the ride with two climbs done. The main event is still to come. The road from ‘Evian’ to Kuala Kubu Bharu is flat with very few interruptions. As the road is open with a lack of shade the sun will be shining strong so remember your sunscreen. You can find a couple of service stations along the way to refill water bottles and grab a snack if necessary. The main event of the day awaits just past Kuala Kubu Bharu. Bukit Fraser is a 37 km, Hors Category climb, starting out of Kuala Kubu Bharu and finishing at the Bukit Fraser Clock Tower. You will gain 1,155 vertical metres over the next 37 km. Making for a 3.1% average gradient from the bottom to the top. Pressing on into Kuala Kubu Bharu you make a right turn towards the dam and almost immediately you start to climb. The Bukit Fraser climb starts gently as it winds through the vegetation before cresting the dam. Enjoy the momentary level road for the next 5 km as it is the last respite you will have before reaching the summit at the Clock Tower. After the dam, Bukit Fraser is a steady 3% for the next 20 km. You wind in and out of sunshine and climb the easy gradient until you reach the ‘Gap’ where you will find the Bukit Fraser signpost. Passing the ‘Gap’ you will need to climb to the summit. Follow the road left at the gate which will lead you onto a one way road. This road loops to the Clock Tower and back. The summit climb averages 5%, gaining 369 metres in the last 7.59 km. Unlike the preceding 30 km the summit climb pitch changes often. The gradients are sometimes as steep as 11%, with stretches of 2%. Personally the pitch changes are a nice change to finish off the mammoth climb, as challenging as they are. As your reach the top you will pass under the gantry to the Clock Tower, and complete the climb at the roundabout where the Clock Tower sits. There is a restaurant and after 100 km and already 1,484 metres of categorised climbing it is a great opportunity to stop for lunch. It can be cool at the top and along the descent, so best to pack a gilet or wind breaker to stay warm. The Clock Tower marks the half way point of the ride in terms of distance, but further than half way in terms of climbing. After a bite to eat and a bit of rest it’s time to start your journey home. There are 2 roads which you can take from the Clock Tower roundabout. One climbs further but goes nowhere; and the other takes you back down the mountain. You will need to climb one more pitch just past the roundabout before you can enjoy the lengthy descent off Bukit Fraser. Be careful on the 7.59 km descent off the summit as the road surface is pitted and weather torn. Also frequently off camber. If you are lucky enough to have a clear day the views out to the left are spectacular. Worthy of a picture. The view down the valley is a nice reward for the nearly two hour effort of a climb. Reaching the base of the summit is less than half the descent. Here you have two options, with both options you have another 30 km to descend. You can turn right and head back the way you came through Kuala Kubu Bharu or turn left and head back to Kuala Lumpur via Bentong. Heading back via Kuala Kubu Bharu is the reverse of the outbound leg. Both climbs are relatively equal when climbed from the North side. The ride distance will come in at 200 km when you arrive back in Kuala Lumpur. Riding back via Bentong the ride extends past the 200 km mark and you only tackle one more climb to get home. For this journey we are traveling back via Bentong. 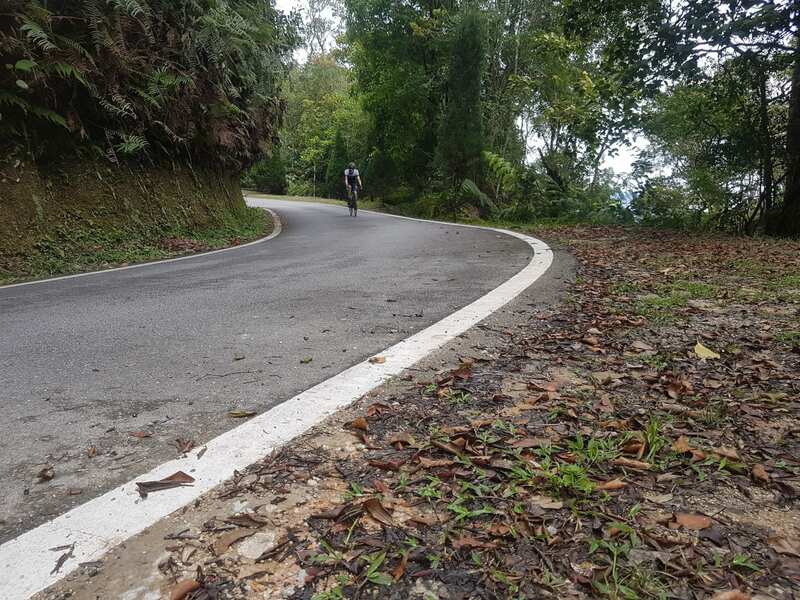 Before reaching Bentong you first enjoy the 30 km descent which winds and weaves back down the mountainside. The gradient is much the same as the climb and barely breaks -3%. After the descent you will make a right turn as you reach the small township of Tranum. Continue along the open road between palm plantations for the 20 km before you arrive in Bentong. The road surface is not always so kind during this stretch. 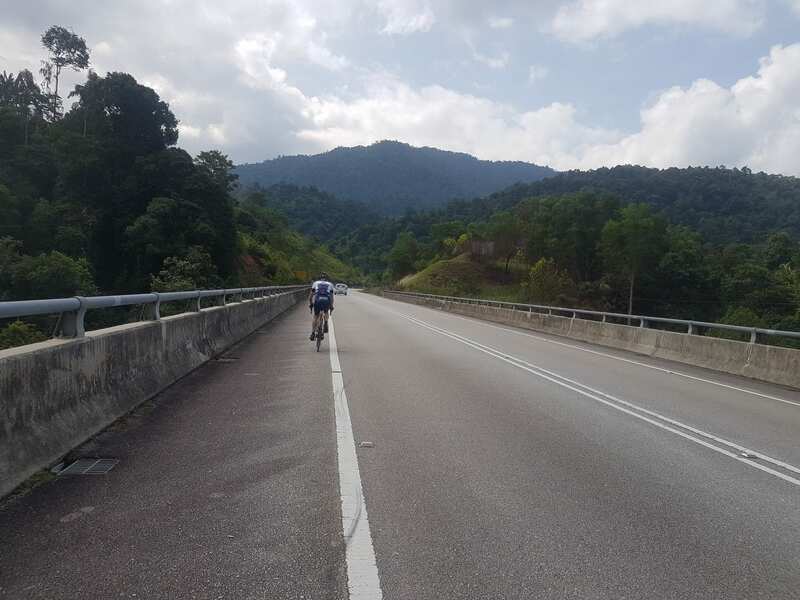 Reaching Bentong you will have some 180 km of riding in the legs, take the opportunity to stop and fill up your water bottles, grab a snack and an ice cream. From Bentong you weave up the foothills of Genting Highlands following the river and ducking under the highway multiple times. Riding through the rain forest is a pleasant change from the open roads through the palm plantations. The Genting Sempah climb is 15 km in length and climbs 600 vertical metres with an average gradient of 3%. Genting Sempah starts with a very shallow gradient and increases until you reach the crest. The bulk of the climb is between 3-4%. The top of the climb has two stretches which pitch greater than 10%. After 200 kilometres these two pitches really sting the legs. You won’t summit this climb, but rather crest in the foothills before the run back into Kuala Lumpur. Turning left at the service road at the Genting Sempah highway entry will lead you onto the descent. Be careful not to continue straight onto the highway. A 15 km descent awaits. Again one must be cautious on the descent as the road is pitted in sections. The descent is a steady negative gradient of -3%. The ride down ducks in and out of tree coverage and sunshine. However if you are running late, or riding slow, you might be descending in the dark. Once you finish the descent it is another 15 km back into the centre of Kuala Lumpur and you can call the day finished!